Cupcakes! How I love these little tempting cakes! They can be so versatile and give you so many options: from the cake to the frosting, ways of decorating, different sprinkles...etc. I recently bought 2 new cookbooks, both about cuppies, and since then I've been in a deep, big 'cupcake mood'. Thank goodness that Xmas is around the corner and I'm gonna have the perfect excuse to bake like there's no tomorrow. 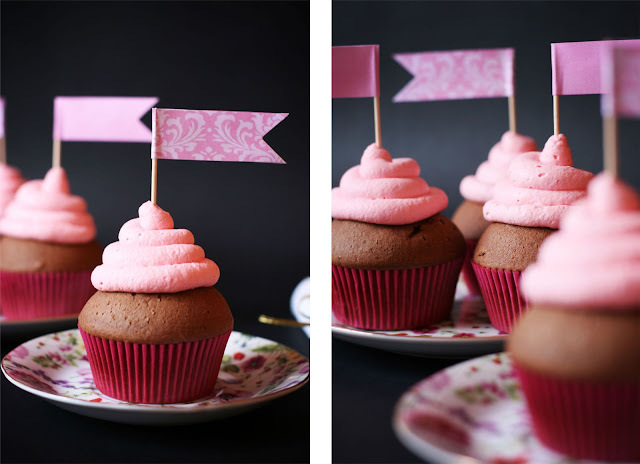 It was my niece's birthday so I went for a cute, kind-of-girly-looking cupcakes but not too much sweet or over-decorated (read kitsch here). I'm not a big fan of buttercream frosting, they are just too much for my taste, I don't like desserts with a big amount of butter in general. 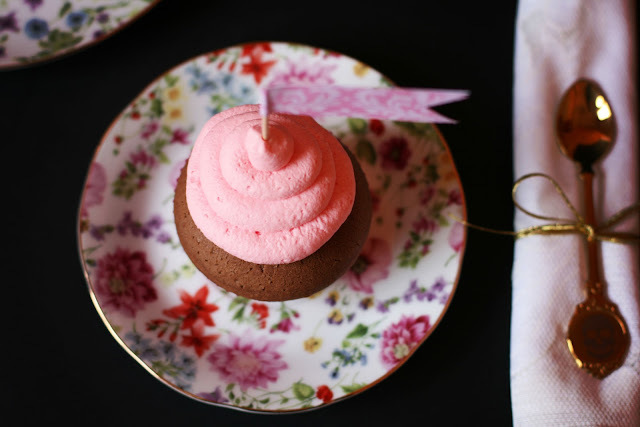 So I was googling for easy marshmallow frostings and came across Mabel's cool blog and her easy strawberry marshmallow frosting. It doesn't taste too sweet and it's a perfect idea for making cupcakes for kids cause this frosting is made with marshmallow strawberries (not the Fluff's strawberry-flavoured mm) that you'll find at almost every candy shop. 1 tbsp cocoa powder, sifted. *Note: I will add a few more next time to emphasize the strawberry flavor. Preheat oven to 190ºC (374 ºF). Line a 6 cupcake tin. In a large bowl, beat with an electric mixer margarine and sugar. 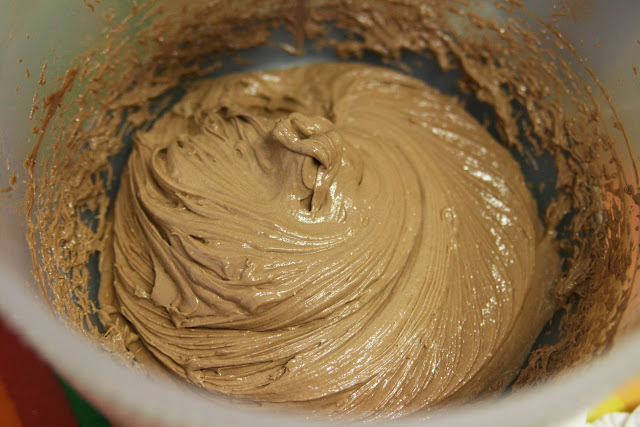 Add in eggs, flour and cocoa powder until a soft paste forms. 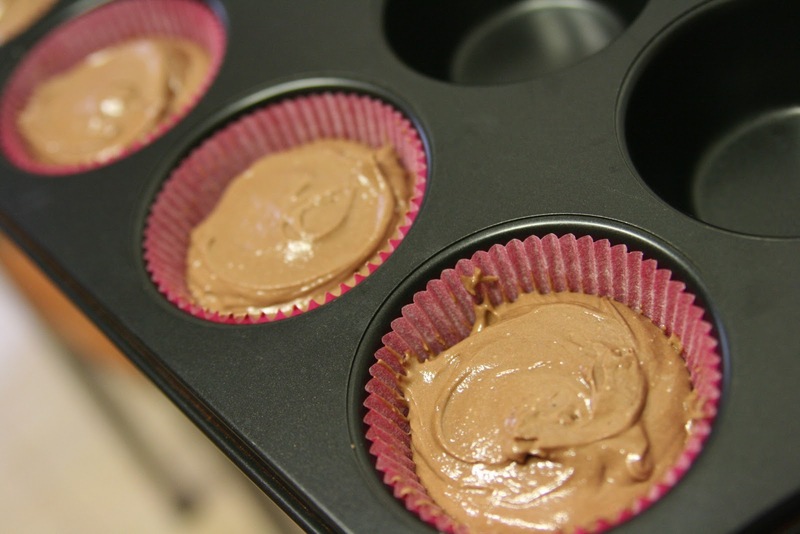 Pour in the cupcake tin half the batter and place a small chunk of chocolate in the center (or you can add chocolate chips to the batter). Scoop the rest of the batter. Bake the cupcakes for 20-25 minutes, until a wooden stick comes out clean (or any cake tester for that matter). Let them cool in the tin for 10 minutes and remove them and cool on a wire rack completely. While the cuppies are cooling it's time to make the frosting. Put the cream in a medium/small saucepan. 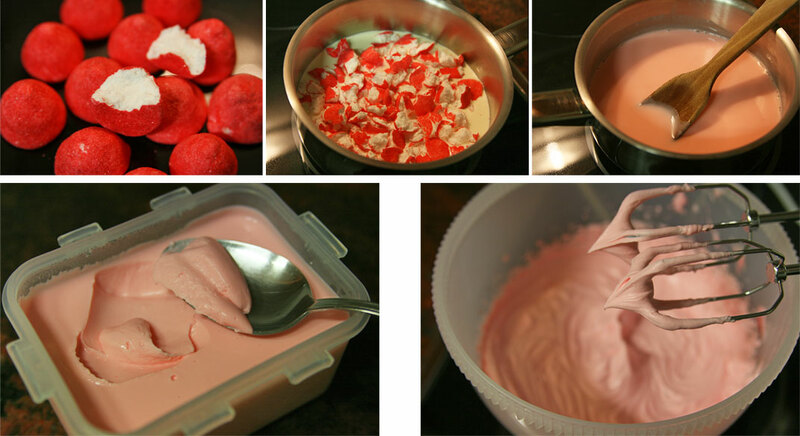 Break the marshmallow strawberries into small pieces and add them to the cream. Melt completely, stirring constantly. Chill overnight in the fridge and prepare the frosting the day after. Whip the cream until it gets a thick consistence, add red food coloring (a small drop, for example Wilton's Christmas Red). 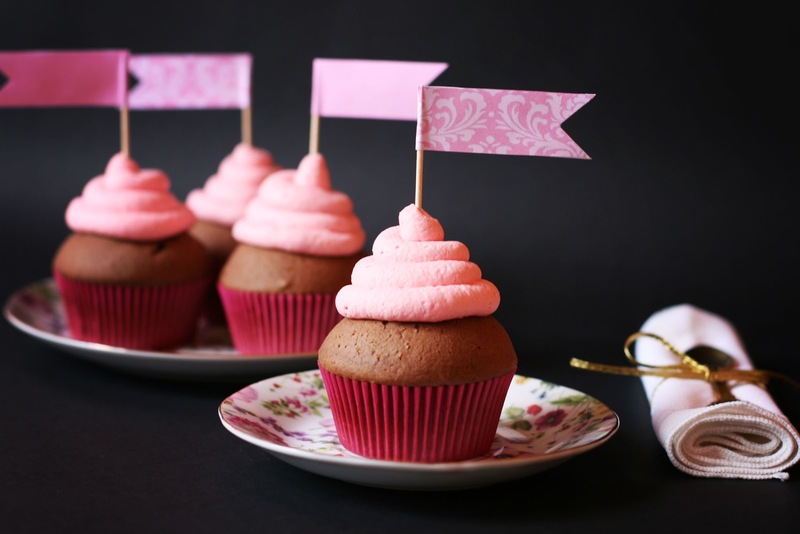 Put the frosting in a piping bag using a round tip (Wilton 2A) and frost your cuppies. Hola Marta! Muchas gracias! Tenía miedo de que me subieran demasiado...porque me pasé llenando las cápsulas pero al final pude poner el frosting sin problema. Es la primera vez que he probado este marshmallow y la verdad es que mientras lo hacía no pude parar de probarlo, jeje. La próxima vez le pondré más fresitas! Maravillosoooo, has hecho un trabajo fabuloso. 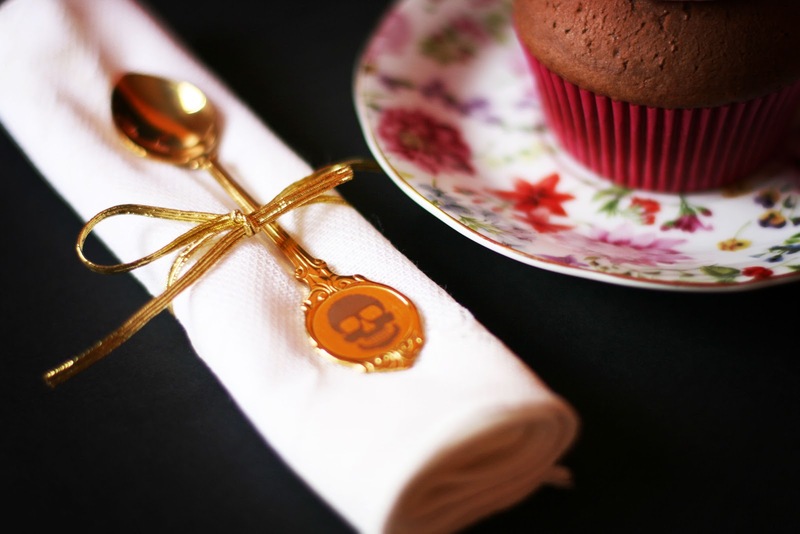 Muchas gracias por el link, y por hacerme conocer tu excelente blog, me quedo como seguidora. Un abrazo y felices fiestas!!! Otro abrazo para tí y que tengas un 2013 estupendo! Wow yummy Cup Cakes..Love this one.. Thanks a lot Rajitha! :-) Greetings from Barcelona. 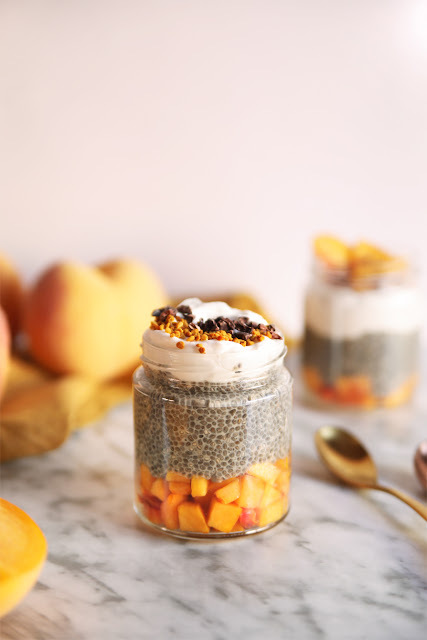 These look beautiful! Wish my piping skills were as good as yours! Thank you! I still have to practise a lot with the piping bag! Hehe. 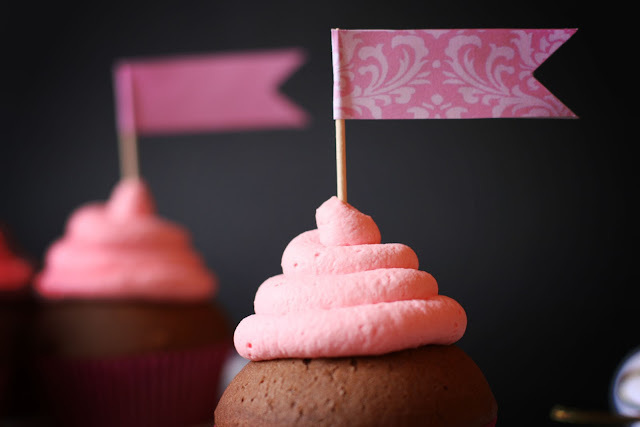 Hi Gemma, I like the pink marshmallow frosting .. look so yummy! Hi Mia! Yes, you can use normal marshmallows to make that frosting. I'd suggest you to use a bigger amount, I'm sure the frosting will gain more consistence/thickness. To add the strawberry flavor, just add a few drops of strawberry extract and red food colouring. :-) Let me know if that works for you!